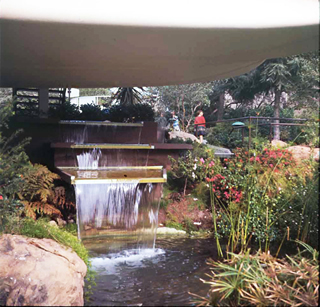 Fountain and garden that ran beneath the house, 1963. 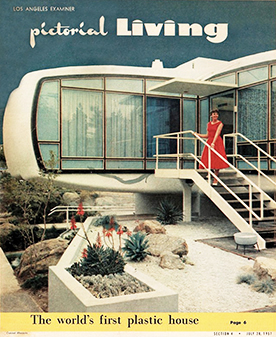 Pictorial Living, the Los Angeles Examiner's magazine, gave the house top billing in July 1957. Popular it may have been, but as we know, the House of the Future became the ‘House of the Past’ in 1967. But it fought hard to survive. Goody himself outlived the house by less than a decade and a half. An avid sailor, he died of a heart attack at the helm. MIT twice a year provides an award in his name “to extend the horizons of existing building techniques and use of materials,” and the firm he founded, Goody Clancy, continues to win honors. Plastic has yet to become the material of choice for homes. In the late 1960s, when the house came down, folks in the industry blamed a lack of understanding among designers [the same problem the House of the Future was designed to eliminate], troublesome local building codes, the “attitude of labor unions,” and pending environmental regulations regarding disposal of chemical waste. One exec admitted that “structural plastics have a way to go” as an architectural material. Although few of us today live in a plastic house, many of us live with plastic components, including Kirwan and his wife Constance, who recently installed a prefabricated plastic Jacuzzi walk-in tub in their home near Harvard Square.